Fire Team Fit Weightlifting Belt Review- Includes Video! ‘If you have been searching for a lightweight comfortable belt then the Fire Team Fit weightlifting belt might be right up your alley, weighing in around 0.6lb it’s certainly much lighter than its leather counterparts, but with lightness comes less rigidity, which isn’t necessarily a good thing? It all depends on how you are training. In this review we take a detailed look at the Fire Team Fit Lifting belt’s main selling points, hopefully you will be able to make a considered decision on whether this belt is right for you, it’s all too easy to go out and buy a belt because you like the look of it, only to get it home and realize you have bought the wrong type of belt for your training. Is The Fire Team Fit Weightlifting Belt Right For You? Most serious powerlifters will probably give this belt a wide birth, and that’s not because you can’t squat or deadlift wearing the Fire Team belt, it’s simply because athletes who are squatting 400-500lb need a belt with a little more security. Don’t get me wrong the Fire Team belt is very good for squats and deadlifts because of the contoured design, which will allow you to move freely, keep better form and most importantly will not interfere with your full range of movement. But being a velcro belt will put off the more seasoned of lifters. For serious powerlifters the flaw with any nylon made weightlifting belt is the velcro fastening mechanism, on the whole velcro works very well with weightlifting belts and you shouldn’t encounter too many problems, but just by the very nature of the stuff, it’s going to start to wear, and when it does you will risk the velcro coming apart under a heavy squat. This isn’t a deal breaker for most of us, like I say unless you’re deadlifting overhead pressing or squatting some serious poundage the velcro should hold up for a few years but for serious powerlifters it’s not worth the risk, which is why most of them opt for a more heavy duty leather belt which utilizes a double prong locking mechanism, where the locking mechanism has no chance of opening under heavy loads. What this belt has been designed for is comfort and it provides that in spades compared to a leather belt, leather belts tend to scratch and dig into the ribcage and need a few months of working in. The Fire Team belt is comfy right out of the pack, countered to fit between hips and ribcage there’ll be no problems with this belt restricting your movements, making it one of the best belts on the market to help you keep your form when lifting. ‍EXERCISE IN THE GYM: Fire Team Fit Weight Belts help promote good form while lifting. Avoid injury and maximize your exercise performance. Unlike bulkier leather belts, this is softer, flexible and more comfortable to wear. WORK OUT WITH CONFIDENCE: Feel and look your best while promoting safe weight lifting technique. Whether you are at the gym or carrying your old dog up the stairs, you can benefit from the added stability of this weight belt. LIGHTWEIGHT CONTOUR DESIGN: This belt is designed to support your back while providing you the mobility to perform multiple exercises. Not only can you Bodybuild using the weightlifting belt, but it is ideal for exercises such as Back Squats, Power Cleans, Deadlifts, Clean and Jerks, Overhead Squats and much more. ABDOMINAL AND LOWER BACK SUPPORT: Unlike a leather belt with a predetermined set of holes, the hook and loop support strap gives the ability to adjust tightness for the desired comfort and support needed for leg and core body movements. LIFETIME WARRANTY: If your weightlifting belt ever breaks or becomes unsafe to use, we will replace it for free. No questions asked. The velcro fit design allows for micro adjustments, this can be very useful for different exercises where you might want to tighten or loosen only by a little, many people who have used a leather belt sometimes find that their waist and the belt are not in agreement and there simply isn’t a right hole where you need to insert the prongs making the belt either too loose or too tight, you will not have to worry about this with a velcro belt. Many people ask themselves do I really need a weightlifting belt? Is it worth paying out $40? Can a belt really prevent injury? 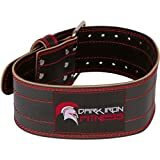 Will I lift heavier if I buy a belt? Some even believe wearing a belt will actually hinder their workout by restricting their movements in some way? We have to remember why we’re buying a belt in the first place, and that is to support your back, there has been a ton of research carried out on the topic, and not only that there’s also been a lot of research done as to whether wearing a belt can make you lift heavier. Another thing a weightlifting belt can help you with is to increase the amount you lift and the speed in which you do so, a few studies have proven that wearing a lifting belt can increase muscle power and muscle stamina, it’s not a huge amount of extra weight 10-20lb but certainly enough to help lifters get through sticking points in their training. Not only does a belt help you lift heavier and protect you from injury, the wearing of a belt forces you to lift with your legs rather than your back, this also leads to increased muscle growth and strength in your legs. Belts are not just for show, wearing a belt really does have massive benefits that not only keep you away from injury but also benefit your training too. To be honest, if this is your first belt you are on the right path looking for a quality nylon belt… A thicker leather heavy duty belt may not be the best idea for a first belt, a belt like the Fire Team Fit belt will last a few years, and for beginners it’s a great belt to help you make the transition over to a heavy-duty leather belt that much easier when your training progresses. The Fire Team Fit weightlifting belt is also an excellent choice for crossfitters who need a belt that’s comfy enough for a wide range of exercises, super fast to take on and off, and offers enough support for heavy lifting sessions. It’s also nice to see the confidence Fire Team have with their belt, they even offer a full money back guarantee if the belt fails in any way when you’re using it, and yes that’s a lifetime warranty! Big thumbs up to Fire Team. Reilly, T. and Davies, S. Effects of a weightlifting belt on spinal loading during performance of the deadlift. J. Sports Sci. 13:433, 1995. Giorcelli, R. J., et al. The effect of wearing a back belt on spine kinematics during asymmetric lifting of large and small boxes. Spine. 26:1794-1798, 2001. Renfro, G. J. and Ebben, W. P. A Review of the Use of Lifting Belts. Strength and Conditioning Journal 28(1): 68-74, 2006. Summary If you are after comfort and maximum support the Fire Team Fit Weightlifting belt is a very good choice, most lightweight nylon belts usually target just the CrossFit market, but the Fire Team fit belt offers that little bit more, and is suitable for some heavy powerlifting and Oly lifting, not for serious competition lifters but for the beginner and intermediate this belt should hold out for a couple of years before the velcro goes.